With a new Superman movie coming out in the summer of 2006, Warner Bros. really needed a new Superman cartoon to go along with it for all the new kids that are now in full Superman mode to watch after the movie, I guess that They either didn’t feel too confident in Superman connecting with the kids or they just wanted to try something new so they decided to go with a Legion of Superheroes cartoon featuring Superman. Well originally the show would have had Superboy but when legal battle came into the picture he became “Young Superman” instead. Of course the movie underperformed and failed to make Superman relevant again and the show didn’t succeed in getting much attention. 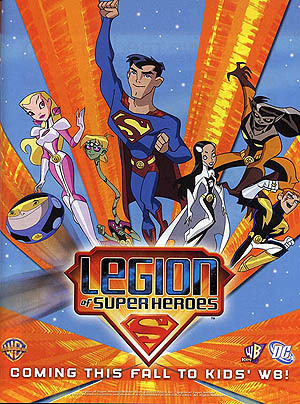 My knowledge with the Legion of Superheroes was pretty much zero and only comprised of their appearance in Superman: The Animated Series and Justice League Unlimited though I did I like them there. 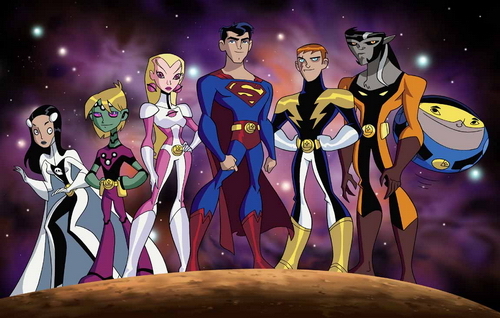 When the show was announced I was pretty excited since it looked like it’d be similar to Teen Titans, sadly from the episodes I saw when it finally aired I was really turned off by it since it was nothing like that or like their DCAU counterparts. In case you don’t know the Legion are a bunch of superheroes from the future that call on Superboy for whatever reason to the future. Let’s take a look back.. Watching through the show I feel I and others didn’t give it much of a chance, like I mentioned the first season is written for a younger audience, so it doesn’t have the more interesting dynamics that other DC cartoons do and its not wacky fun like Teen Titans either so its a bit stale because of it. Though to its credit it has an interesting universe and some pretty cool stuff from time to time. 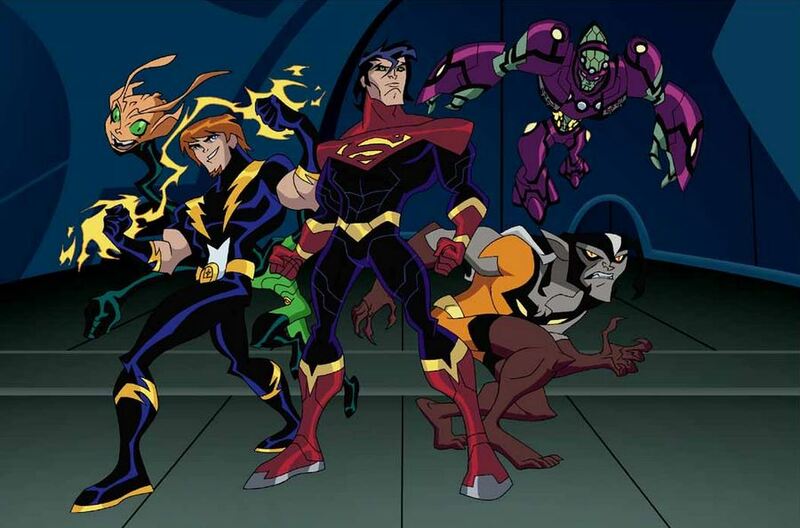 The second season got a radical make over, all the characters are older as there was a time skip many years before Young Justice ever attempted it and the tone is a darker one and its accompanied by better writing. It still has many of the same problems the first season does even with the change though. Apparently the third season would have also featured an even older cast, I wouldn’t have minded a third season which didn’t happen likely because 4Kids took over KidsWB at the time and it wasn’t a popular show either. The fact that there are so many characters and most have generic personalities, you never really care for any of them. JLU handled many characters well but in this show they really missed the boat. So now unto the characters which I’ll lump two or three together so I can have more to write about them. 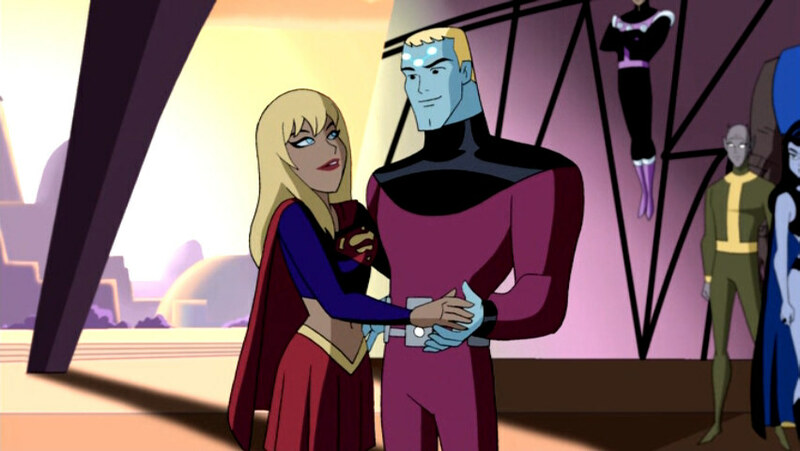 Lightning Lad/ Saturn Girl/ Cosmic Boy – Lightning Lad is featured in most episodes so he’s supposed to be important. He has a generic “I don’t listen” personality and I just never really cared about him much but I never hated him, his arm is cut off in the second season so that’s kinda neat and we did see in the episodes with his brother who had an interesting arc that actually finished. Saturn Girl is the Jean Grey of the group, she is really bland so I never cared for her much. In the second season she only appears for a few episodes near the end and it made me realize that I liked having Saturn Girl around even if she didn’t do much, she doesn’t do much either in her few Season 2 appearances but I liked her being there and she was written a bit better. Cosmic Boy only appears a few times, he’s the leader and a bit of a jerk but not in a bad way and yet he rarely has anything to do. All three of them get a nice origin episode of when they formed the Legion in Season 2. 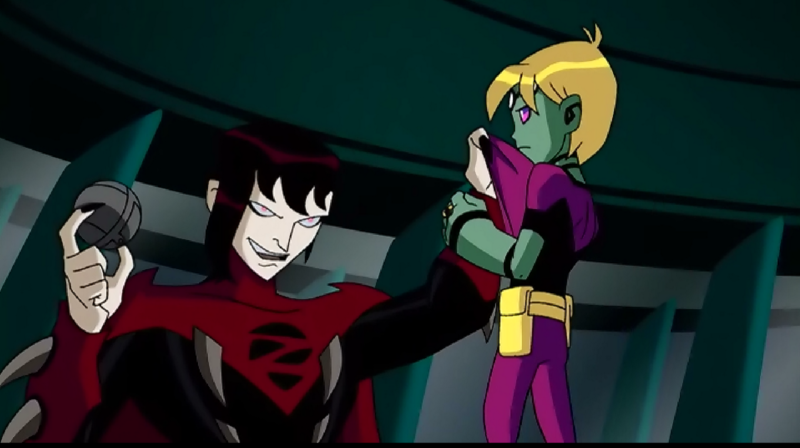 Young Superman / Superman/ Superman X (Kell-L) – Young Superman is basically Superboy and we see him become Superboy err Young Superman for the first time, while he wasn’t written very well, they really could have made him so much more un-likeable so I think they did an alright job with him. In Season 2 he is an older Superman with actual superhero experience…or at least that’s how Braniac 5 describes him as, we really don’t see much of him and the few times we see him he is basically not too different from late season 1 Young Superman. Superman X, the Superman of the 41st Century! Cloned from Superman’s DNA altered to be even more Super since he can now fire freaking lasers from his arms as well as create a protective shield and is immune to Kryptonite. Created by a Ying-Yang looking Lavalamp of two faces called K3NT to stop Imperiex in an age where superheroes no longer exist. You actually feel bad for K3NT as they are erased from history; Now you wouldn’t think of that from what is a freaky Cyborg evil looking thingy thing but you do. 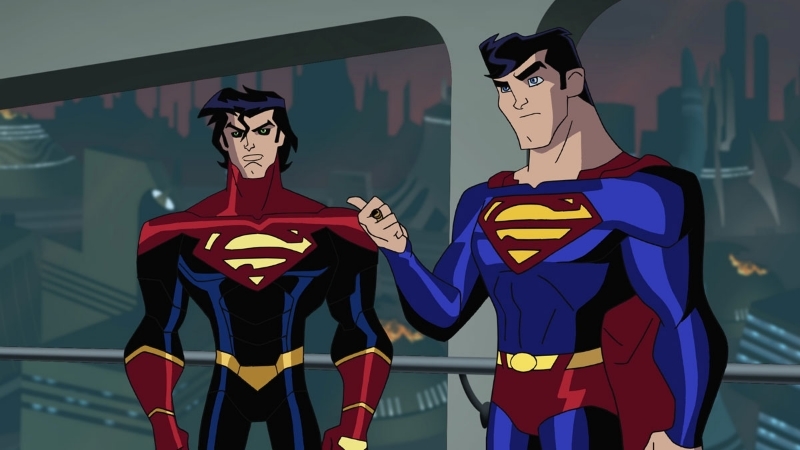 Superman X starts as this angsty Superman that they don’t trust and he wants to work alone and is a nice contrast to the real Superman which should provide some cool stories and is easily the coolest character this show created….however after his first two episodes he is pretty much neutered completely. We see him most of the season which is good and we do see him become more trusting of others as the show goes on however he rarely interacts with the real Superman and is mostly written as the regular Superman of the show with some added angst every once in a while which is a shame. And while at the end he changed his thinking I feel he didn’t get a great send off in the end, too bad. Triplicate Girl (Duo Damsel)/ Bouncing Boy / Chameleon Boy – Bouncing Boy is a character that appears in a lot of episodes, he is a fat boy who can bounce apparently from drinking a soda that had some special chemical which made his body bouncy… I don’t know I read that on wikipedia since its never explained in the show. 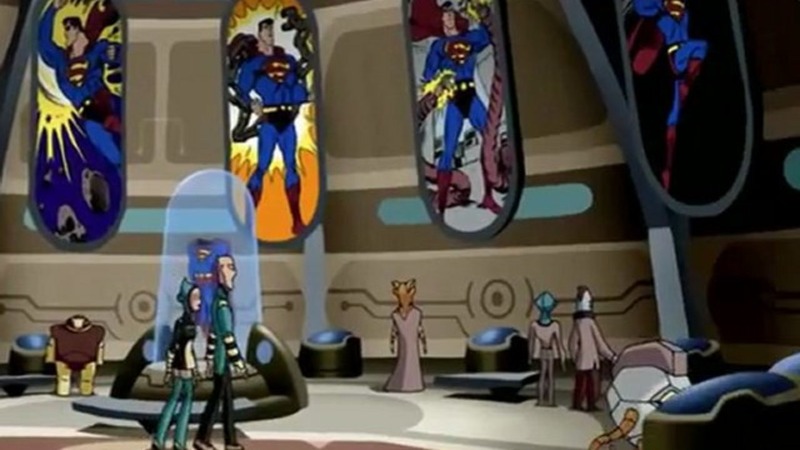 According to Wikipedia he isn’t really that important of a character which is odd counting he appeared in Superman TAS and Justice League Unlimited and is prominently featured in this show and he also lacks a great personality or interesting power. He becomes the leader of the Legion near the end of the first season and by the second he isn’t anymore, no explanation given though none was necessary as we could all figure out he wasn’t cut out for the job. They also kind of set up a romance between him and Triplicate Girl near the end of Season 1, which is kinda there in the first two episodes of Season 2 only for it to be forgotten, Poor guy! He should be more annoying based on all of the above but I don’t think I got to the point of hating him for some odd reason, luckily he is featured less in the second season. Triplicate Girl has basically zero personality and you just see her separate into three and fight occasionally. In the second season one of her umm “yous” is erased from history and she becomes Duo Damsel since she can only split into two now, she is sad but its never mentioned or talked about until we see a quick shot in the final episode of her other “her” coming back to her. Can’t say much about her since she never really did much besides the short little romance that was only a small part of three episodes. Chameleon Boy is just there and never introduced starting with the second season and for some reason it works, I feel like I’ve known him, he is more laid back and can transform into any type of animal/creature he wants. He kinda sounds like Beast Boy of Teen Titans and he kinda is but not really since he isn’t so over the top. He is pretty likeable. Timber Wolf / Phantom Girl / Ferro Lad – Timber Wolf is a weird character, he hets an entire episode to introduce him, something none of the others really got and is never really featured in a big role again in season 1 oddly enough. In Season 2 he once again gets an episode to himself only to be ignored again, on a much lesser extent this time but he still is. Phantom Girl is a weird one and always reminded me of Raven of Teen Titans. This mall goth looking girl who has what appears to be cartoon Ravens powers. She looks cool but once she opens her mouth she sounds like a small normal girl which is quite weird, she appears to have a crush on Superman but like a lot on this show, it is ignored later on. Her personality could have worked if she had been given more time which she didn’t. It didn’t help that I expected her to have a more Raven-ish personality even if it had covered ground Teen Titans already had. Ferro Lad is only featured in like 3 episodes, and oddly enough in those few 3 you care more about him than most of the other Legionaires. He doesn’t have a lot of screen time but he at least had a personality during those and he is only made more legendary in this show since one of the most interesting characters sacrifices himself shortly after being introduced. Braniac 5 – Braniac 5 is easily the best written character in the whole show. I don’t pretend to understand just what he is, apparently the fifth version of Braniac which makes sense until they showcase an entire planet of Braniac robots. He appears to have hair which is odd for a robot and in the second season he aged like the other heroes even though he is a robot..maybe he built a new body for himself? He is a hero to make up for the legacy Braniac 1.0 brought to the world though he doesn’t tell Superman that at first until forced. He is a control freak and because of his 12th level intellect seems to regard himself superior to the others which I’d totally agree. He also seems to have a huge mancrush for Superman. He is obsessed with him and I do mean he seems to like him like him as there are plenty of scenes that seem to be intentional, if Tumbler had existed back then this would’ve been a hit. In the first season he seems to hold some secrets from superman and even others like holding kryptonite and intentionally not wanting to tell him about his past whether its to protect the timeline or something more. 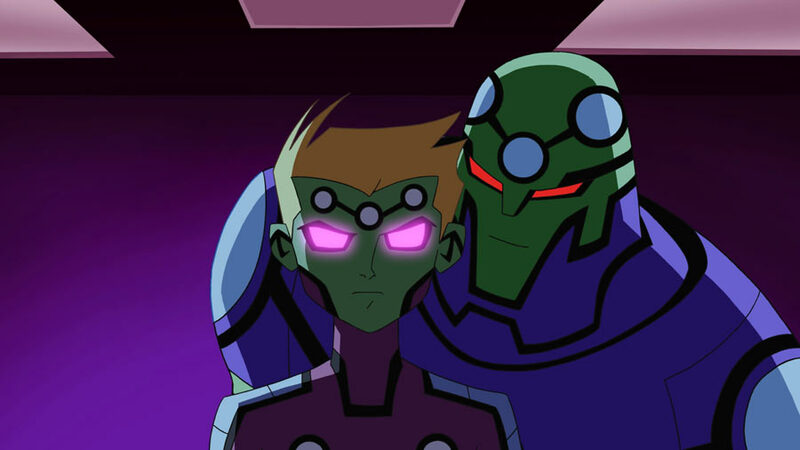 In the second season it seems Braniac 1.0 still has some control over him and when he needed some old files the old Braniac is able to take more and more control over him. He eventually becomes the old Braniac and becomes an awesome villain only to eventually overcome Braniac 1.0. Season 2 ends with a remain of Braniac 1.0 still alive floating in space and somehow Brainiac 5 became a real boy like Pinocchio which even if not explained is kinda cool, he also leaves the Legion to set up the story arc of Season 3 which never happened. Those are all the main Legionaires, theres a lot more who have one or two lines or just fight in the background so not much to say about them now unto the Villains I found interesting, only missing Lightning Lad’s Brother Mekt since I kinda covered him already and The Controller who is the season 1 finale main bad guy with the sun-eater but thats about it for him. 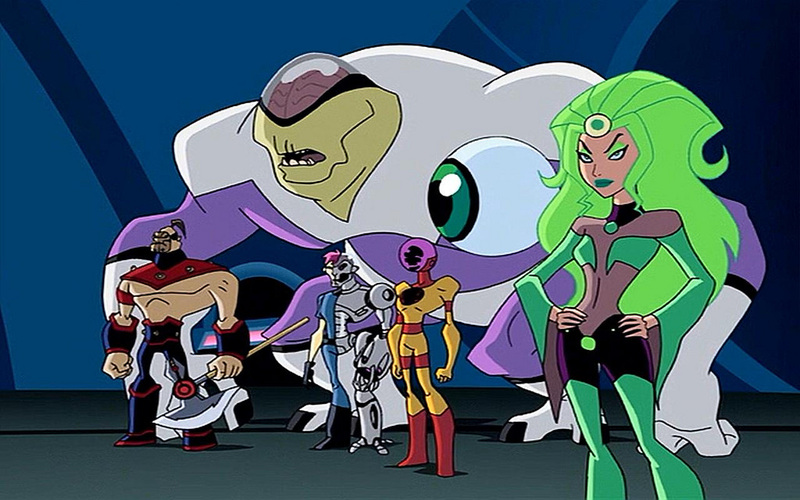 Fatal Five- The Fatal Five who also appeared in Superman TAS and JLU are the reason the Legion has to call Superman from the past and they don’t seem much of a threat and are taken care of after a fight. They appear again only to embarrass themselves and any threat they may have appeared to be. They help the heroes in the first season finale, the only time they are made to look cool only to quickly try to double cross the legion in which they fail terribly at and lose any dignity they had left. They don’t appear in Season 2 as a team but we see some of them separately and appear more of a threat, specifically Validus but yeah not very impressive villains for the most part. Drax – Released from the Phantom Zone by accident by Superman, we never find out who he is except that he was born inside there and has all of Superman’s power but is immune to Kryptonite. He had a pretty cool episode and yet sadly we never find out more about his past which is only teased at since he sadly never appears again, what a shame. 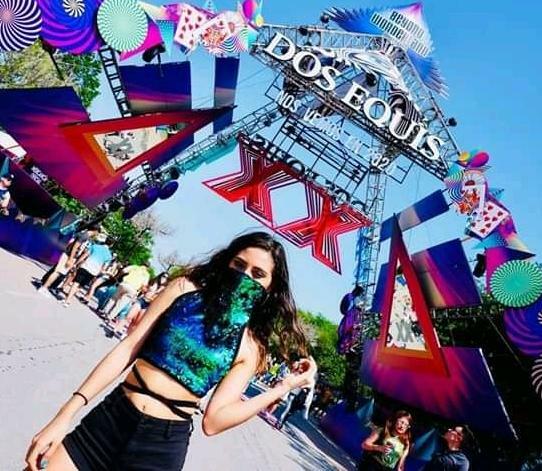 Alexis Luthor – Alexis is a spoiled rich girl who is good with technology and wants things her way, her episode deals with getting angry that Superman won’t pay attention to her so she does petty things to get her way until it ends with her trying to get rid of the Legion so she can be with him. 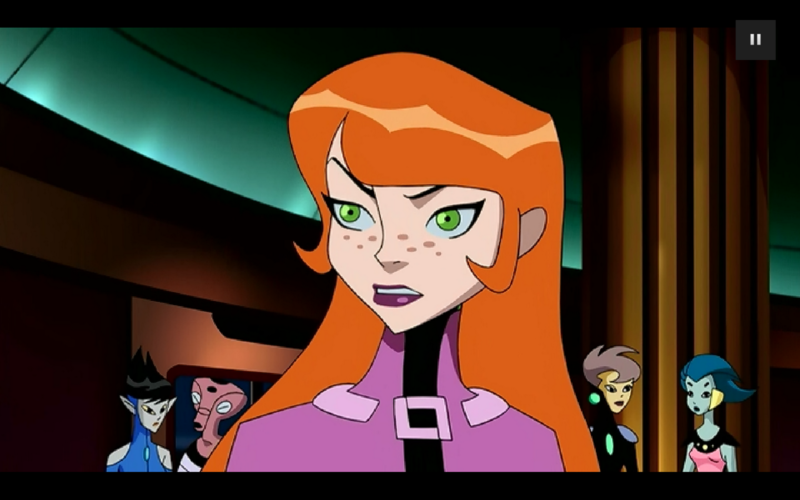 The episode ends with her hair being blown off by superman after trying to save her from the robot she used to attack the Legion and we see her planning her revenge from her jail cell. Yeah she’s basically a girl kid version of Lex Luthor but that made her awesome in my eyes and sadly we never see her again save for a quick non-speaking cameo in a later episode. Why they never used her again boggles my mind, she was cool and like Drax she was set up so we’d see more of her and we didn’t yet others like Zyx/Grimbor did get a second episode. Grimbor/Zyx – Zyx is the Mxy of this show, except he isn’t from the fifth dimmension but just a planet about magic which is lame. Unlike the Batmite in Brave and the Bold and Larry in Teen Titans his episodes really aren’t that crazy fun and are just annoying, we have to endure him for two episodes sadly and neither is much interesting. Grimbor appears twice, I think they meant him to be a cool character since we don’t know much about this masked guy except that he can take the on the Legion farely well. So yeah he’s supposed to be a badass character but it didn’t work for some reason. 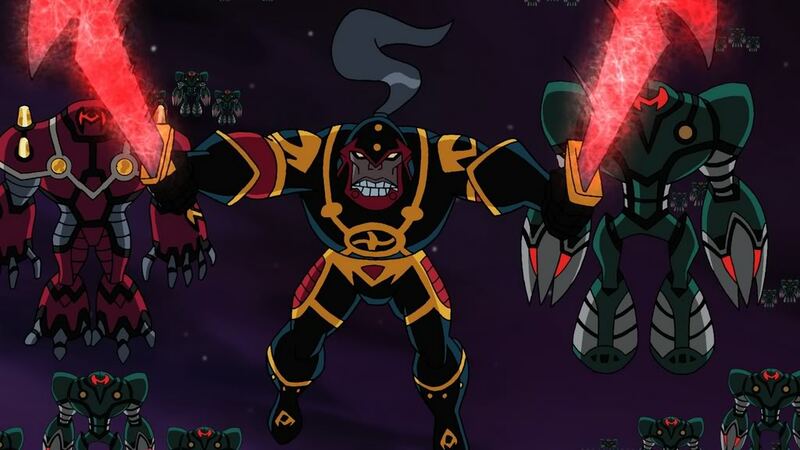 Imperiex – The main baddie for Season 2, he is set up as this ultimate badass, in my mind he seemed to rival Darkseid in terms of power and he basically had the 41st Century almost conquered. However like Superman X after the second episode he is also neutered and after that he doesn’t seem that big of a threat and more of a generic cartoon villain and they even give him an origin that makes him look even more of a wimp. At least he should get one epic fight in the finale right? Well he is killed by Braniac 1.0. This would have been disappointed except for the fact that he was killed in a pretty awesome way and made Braniac look like a real threat so I didnt mind it. But we didn’t get an epic fight in the finale against Imperiex but he had already been handled so badly I didn’t mind it. So yeah the blandness of the characters and a few lame plots don’t help the show but there’s plenty of action as well as cool concepts that in my opinion are worth a look. Like I mentioned, no this isn’t DC Animated at its finest and the show has plenty of flaws but if you are curious about it there is enough to keep you interested. 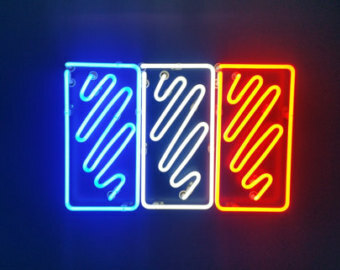 So is it any good? Well its definitely not great but its not bad either. I’d say if you’re interested in the Legion characters or just curious about the show you should check it out, just treat it as its own thing and don’t compare it to other much better DC Animated offerings.